The final Matriarch, like so many before it, will be a good one. The nine-horse field contains four Grade 1 winners and is loaded with accomplished fillies and mares. At time of writing, the forecast is that the rain that has been falling on Hollywood Park will give way to sunny weather on Sunday. We'll see how that goes. Pianist and Egg Drop are projected to be head and head for the lead at the opening half. Dayatthespa is close behind. Discreet Marq, Better Lucky, and Stormy Lucy follow in striking distance. Then it's back to Wishing Gate, while My Gi Gi and Tiz Flirtatious bring up the rear. Egg Drop (8-1): Mike Mitchell filly has found a home on the grass, where she has three wins from four starts. She enters this race off two Grade 2 victories, but this is a different order of competition today. The Race Rating from her last race, a 99, is dwarfed by the Race Ratings of the recent races of some of her competition. Her best grass speed figures, a 103 and a 106, are marginally competitive, and her rail draw, when combined with her early speed, gives her a look at a perfect trip here. Mitchell gets excellent ratings of 95 when he's attempting a repeat victory and 97 with race spacing similar to today's. This game filly is not without a chance, but this is a tall order. Tiz Flirtatious (5-2): Grade 1 winner had a very difficult trip in the Breeders' Cup F/M Turf. She got into a difficult spot fairly late in the race, and that she somehow managed to make a run from there and lose by only two lengths is a testament to her quality. Her best speed figures (114, 110) can play with anyone in here. Her trainer, the splendid, underrated Marty Jones, gets a 100 rating in 3up grass stakes races. She fell a length short in this race last year (another gallant effort from a gallant mare). She's a strong contender, and if this race were a furlong longer, she would be our top choice. But she figures to be circling the field from last place or thereabouts, and at a short price, to boot. Dayatthespa (3-1): Favored in last year's edition of this race, she had a trip that was about as eventful as trips get, ultimately coming undone and trying to jump the rail, thus losing all chance and injuring herself into the bargain. Her brilliant trainer, Chad Brown, got her straightened out after that debacle, and she is back in style. Another Grade 1 winner, she enters this race off a powerful speed figure of 114--earned while losing by a head to Better Lucky, whom we will be getting to shortly. Dayatthespa exits a race that received a strong Race Rating of 112. She comes in off 57 days rest. Chad Brown gets so many ratings of 100 in the relevant TFUS categories that we aren't going to bother citing them. She figures for a good stalking trip. Strong contender. Pianist (6-1): Chad Brown again. So fill in all the 100 ratings. Pianist ships to California off two 108 speed figures. She has twice won Grade 3s. She nearly won a Grade 2. She gets tested for class today. The Race Rating of her last race was a 107--a cut below the best in here. She may be able to clear her early competition and drop over to the rail before the first turn. We don't really see this filly winning this race, nor do we see her as hopeless. At minimum, she is usable in exotics. Better Lucky (9-2). She won this race last year, and we like her chances to repeat. She has two Grade 1 victories to her credit. She has run speed figures of 114 in her last two starts. She was visually impressive in her last start, making a long wide run to reach the lead and outdueling Dayatthespa in a long drive. This will be her third start off a short layoff, and her trainer, Thomas Albertrani, gets a terrific 99 rating in these situations. She has good rest coming into this race. At anything like her morning line odds, she is our selection. Sunday's Grade 1 Hollywood Derby brings together 10 horses to run 10 furlongs on a turf course that we expect to be firm. The colt to beat is Admiral Kitten, but as with most deep closers, Admiral Kitten's chances will depend heavily on the pace scenario, which doesn't figure to be favorable to his chances of winning. This is an animal who always seems to fire, but he has been a bridesmaid five separate times this year and visited the winner's circle only once. In a big field, it's difficult to accept the 5-2 morning line on a horse who has more often than not come up short. That said, we fully expect Admiral Kitten to contend for the victory on Sunday. He has strong speed figures. His trainer gets a TFUS Trainer Rating of 94 when switching circuits, as he is doing today. Indeed, there is plenty to like here. But there are certainly candidates that could get the jump on him and leave him with too much to do in the final stages of the race. The TimeformUS Pace Projector puts the #3 horse, Gervinho (8-1 ML), on an uncontested early lead in a race that favors horses on or close to the pace. Gervinho is coming off a dull effort in which he posted a disappointing 92 figure while finishing a close-up third in the Grade 2 Twilight Stakes. But there are reasons to think Gervinho is sitting on an improved effort as he stretches out to 10 furlongs. Based on his two-year-old figures, this is a horse with plenty of upside. A year ago, he ran a 96 figure in finishing a close 5th in the Breeders' Cup Juvenile Turf. The race must have knocked him out because he didn't come back to the races until June of this year. In his four starts as a three-year-old, Gervinho has run well, if not quite spectacularly, hitting the board in each start and posting a top figure of 100. He retains the services of Rafael Bejarano, and trainer Carla Gaines sports a strong 96 rating when using Bejarano. Gervinho is a threat to steal the race. European shippers must always be taken seriously when they challenge US-based horses on the grass. While we don't expect Seek Again to be anywhere near his 6-1 morning line when the gates open, this horse is a major threat. Two races back, he finished 5th in a stakes race, which seems a bit more impressive when you consider that 31 horses went to post for the race, a number that makes the typical Kentucky Derby field look small by comparison. Then, in winning his last race, Seek Again posted a 112 figure, which is by some distance the best number earned by any horse in this field. Intuitively, we harbor some degree of skepticism about this colt's 10-furlong breeding, with the sprint sire Speightstown on top, but the 83 Pedigree Rating for turf routes helps calm the nerves a bit. Perhaps the dam-side breeding will come in handy because we feel he's another who will get the jump on Admiral Kitten and have every opportunity to hold that one at bay in the final strides. Longshot Irish Surf rates a look. This horse promises to be at least 15-1, and possibly north of 30-1. Note that this is one of the few horses in the field with experience at this distance. In fact, Irish Surf has been running against older horses at longer distances. Two races back, he lost to Indy Point by only six lengths. Indy Point hit the board in the Breeders' Cup Turf. A repeat of that sort of effort gives Irish Surf a good chance to be in the exotics on Sunday. The Play: Gervinho and Seek Again in multi-race wagers. Gervinho and Seek Again in an exacta box, and then Admiral Kitten underneath each in exactas. Gervinho, Seek Again, and Admiral Kitten on top in trifectas with the same three and Irish Surf in the two/three holes. A fascinating edition of the Clark Handicap is led by Game On Dude and Will Take Charge. The former was a soundly beaten post time favorite in the Breeders’ Cup Classic, and the latter came up just a nose short in a very exciting stretch drive. They are joint highweights from a weight-for-age standpoint, the older Game On Dude carrying 126 pounds and the three-year-old Will Take Charge shouldering 123 pounds. Handicappers must answer one compelling question with Game On Dude. Can he recapture the tremendous form he was in prior to his abysmal showing in the Breeders’ Cup Classic? Game On Dude hasn’t raced at Churchill Downs since finishing second in the 2011 Breeders’ Cup Classic at 14/1 odds under Chantal Sutherland. He draws the inside post position and won’t be able to make an easy lead with the presence of the very speedy stretch-out sprinter Our Double Play in this race. He’ll need to be at his par level of form to win. Meanwhile, the question with Will Take Charge is not if he can recapture his good form. He’s obviously in incredible form right now. Rather, the question is whether he can maintain that excellent form for one more race. Will Take Charge had a sensational summer campaign, finishing a good second to Palace Malice in the Jim Dandy before winning the Travers by a nose at 9/1 odds. Lukas, somewhat uncharacteristically, allowed Will Take Charge to run in the Breeders’ Cup Classic off of a six-week layoff, and he responded by running his eyeballs out and delivering a double-digit new career-top speed figure of 121. Now, however, off of just 27-days rest and the most gut-wrenching performance of his career, Will Take Charge must ship back to Churchill and make his 11th start of the season. From a statistical standpoint, D. Wayne Lukas-trained horses have struggled mightily at Churchill Downs over the last few years. And they are just 1-for-63 at Churchill Downs so far in 2013. Note his mediocre trainer rating of 36 here. Since 2008, Lukas-trained horses are just 1-for-85 in stakes races at Churchill Downs. Worst of all, since 2008, they are just 36-for-444 (8% wins and a miserable $0.82 ROI) in dirt races at Churchill. It’s going to be hard to accept a short price on Will Take Charge in the Clark after such a strenuous effort in the Breeders’ Cup Classic. Golden Ticket will almost certainly be the third choice in the wagering, but I feel pretty confident that he can be opposed. It is true that Golden Ticket raced against a speed-biased track when he finished second in the Breeders’ Cup Dirt Mile. However, he received the pace setup of a lifetime. Goldencents ripped off impossibly fast fractions and gutted every horse who tried to stay in contact with him. The final quarter of the dirt mile was a pedestrian 26.48 seconds over a surface that was yielding incredibly fast times. Golden Ticket did all of his running as the race collapsed. From a pure value standpoint, Easter Gift is unquestionably the horse we want to key in the Clark. He ran a career-best speed figure of 115 last time out and has been freshened for excellent trainer Chad Brown. Note the slew of 100 trainer ratings Brown possesses. Easter Gift has been hindered by poor breaks, slow paces, or wide trips over his last four starts, and, while most horses exiting Breeders’ Cup races tend to disappoint, he’s the horse who comes into this race most likely to fire his best shot. Betting Strategy: Bet Easter Gift to win. And key him underneath Game On Dude and Will Take Charge in the exacta. The $250,000 Grade Two Citation handicap features eight strong older horses running 8.5 furlongs on the Hollywood Park turf. For handicappers, it’s an interesting puzzle, one that raises questions related to both class and condition, as several of the leading contenders exit tougher races, and a late-developing five-year-old tests the deeper waters of stakes competition. The chance of rain in Southern California leading into Friday only adds to the degree of difficulty. For those who believe in class, the first question is if the intriguing 12-1 longshot Bio Pro is up to this level of competition. Bio Pro was last seen on October 27th, when he won a restricted stakes race in stylish fashion and earned a speed figure of 110. He comes back 33 days later needing to repeat or improve upon this career-best effort in order to factor into this Black Friday affair. Although he has raced nine times in a year that began with a maiden claiming victory, his last race left the impression of a horse capable of further short-term improvement. Bio Pro’s trainer, Howard Zucker, is a competent veteran who sports a strong 86 rating with horses coming back on 24 to 41 days rest. Zucker also scores the maximum, a 100, with turf routers. The top morning line selections, Silentio (5/2) and Winning Prize (7/2), both appear equipped to win this event. Silentio is coming off a 124 figure for his excellent third-place finish in the Breeders’ Cup Mile. If he repeats that performance, he will be very difficult to beat, but he is likely to regress off only 27 days of rest. His trainer, Gary Mandella, sports a modest 64 rating off of comparable rest. Silentio benefited from an ideal inside stalking trip in the BC Mile, and, while he has run consistently well all year long, he has yet to post a single victory in five starts. We cannot support him as the likely wagering favorite. With only two career starts in the US, Winning Prize is a difficult horse for this handicapper to take a strong stand on. The TimeformUS Pace Projector puts Winning Prize just off a fast pace set by a longshot to his inside. While it’s clear from his two performances in the US that Winning Prize has good tactical speed, it remains to be seen if he can settle just behind a rapid pace and deliver enough late kick to defeat this solid field. He is, however, in the masterful hands of trainer Neil Drysdale, who sports an 82 rating with horses coming in off a 41-69 day gap between starts. Also note that Drysdale has worked this horse seven times since the October 5th Shadwell Turf Mile, a race that was rained off the turf and instead contested on a moist and unpredictable poly surface. Winning Prize ran a creditable fourth in that race, earning a strong speed figure of 117, and now returns to his preferred surface, where he sports an outstanding 7-6-1-0 lifetime record. He’s the type of horse we would include in every exotic position but refuse to key. This leaves cross-country shipper Summer Front (4-1 ML) as the selection. Like Winning Prize, Summer Front exits the Shadwell (Poly) Mile (and a sixteenth). The four-year-old son of War Front is zero-for-three lifetime in non-turf affairs, which makes his last race a throw-out. He has won seven of eleven career turf starts, and his only off-the-board finish was at a mile and a quarter on this surface, a race in which he had a very difficult trip and was stuck behind a wall of horses at the key moment of the race. He has run only four times in 2013 and appears primed by his skilled trainer, Christophe Clement (94 overall trainer rating, 91 rating on 41-69 days rest, 96 rating with jockey Joe Bravo), to deliver a peak performance. From his inside post position, Summer Front figures to save ground well off a solid pace and should have every opportunity to make a big impact on the race in the final 50 yards. The Play: Summer Front to win. Summer Front in exacta boxes with Winning Prize (heavy) and Bio Pro (lighter). 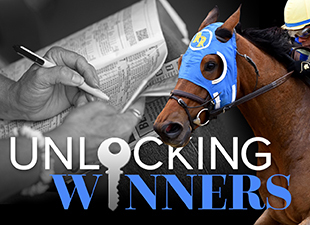 Summer Front keyed on top in trifectas with Winning Prize, Bio Pro, and Silentio. It isn't all that common to see a three-year-old made the outright high weight in a Grade 1 Handicap race against open competition, but that is what Goldencents has been made in what could potentially be a case-maker for an Eclipse Award. Of course any such divisional championship bid would require either a flop by Will Take Charge in Friday's Clark or voters to credit brilliant wins at a mile towards Goldencents' resume as a sprinter. Even though precedents from eras long gone would suggest Goldencents shouldn't have been assigned high weight over older horses as accomplished as Flat Out and Groupie Doll, recent form does suggest that Goldencents deserves that honor. Goldencents has rattled off three consecutive speed figures of 119, and his victory in the Breeders' Cup Dirt Mile, even over a speed-biased surface, was an absolutely devastating display. In plain English, Goldencents ran his eyeballs out in the Dirt Mile. Sent early from extreme outside post position number eleven, he set blistering early fractions and gutted all of his early pursuers. With a click of the "behind" button, the TimeformUS result chart reveals that all of his early pursuers faded from chasing him, and that the horses who ended up finishing first and second were both at least 14 lengths behind him after a half mile. The crucial question is, can Goldencents reproduce that type of form today? I don't believe he can. The cross country ship and the projected quick early pace over a tiring Aqueduct surface that has been producing moderate raw final times are enough reason to have doubts. Groupie Doll was purchased for $3,100,000 as a broodmare prospect out of a sale at Keeneland a few weeks ago. Her new owner, Mandy Pope, is gamely giving the five-year-old champion a swan song against the males. Groupie Doll is an admirable champion, and she missed by only a nose in a weaker edition of this race last year. However, her recent speed figures indicate she's in over her head, and after gamely gutting out a win over Judy The Beauty in her seasonal main objective last time out, it's hard to believe she'll elevate her form in a race that is an afterthought. Groupie Doll is a bet against. Verrazano is a powerful colt who has performed at his best with easy trips in races over dull surfaces. Verrazano's career-top speed figure of 121 came over a dull and tiring Monmouth Park surface that was yielding slow final times in route races all day long. It stands to reason that he will appreciate Aqueduct's main track if it continues to play as slow as it has for most of this meet, but there is an awful lot of pace pressure in this race, and we will look to play against him. Flat Out will be our key horse. Not only does he project a favorable trip from behind an expected fast pace, but he has always been a genuine top-class horse at NYRA tracks (as well as a relative chump when he's shipped outside of New York). Flat Out's season-best speed figure of 129 came at today's distance, and he can certainly win this if he runs his race. Historically, this race has been won by routers more than sprinters, and Flat Out is the horse who best fits that profile. Betting Strategy: Win bet on Flat Out. 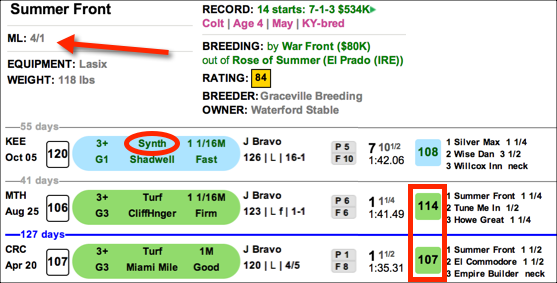 TimeformUS past performances have a cool feature that allows you to display the incremental splits for each horse. In the case of Honor Code's career debut (at seven furlongs), he crawled his opening quarter in 24.89 seconds. His second quarter was a snail-like 24.36 seconds. Horses normally start to decelerate sharply in the third quarter of seven furlong races, but not Honor Code. He turned on the rockets and unleashed a 22.29-second third quarter, much of it run around the far turn. After that freakish third quarter, he powered home with a final furlong in 11.94 seconds over the gooey going, and easily drew off to win by more than four lengths, with a pair of next-out winners finishing second and third behind him. Even though it earned a speed figure of just 82, Honor Code's debut win was the stuff of legend. Indeed, the hype was so great that he was pounded down to 9/5 favoritism in the Champagne Stakes next time out. While benefiting from a quick and contested early pace and added distance in the Champagne Stakes, Honor Code again displayed a great deal of ability, this time when finishing second beaten just a neck to Todd Pletcher's best two-year-old, Havana. Honor Code was assigned a 108 speed figure for that performance, and he achieved that speed figure despite racing extremely wide on the far turn. No other horse in today's field has ever run a figure faster than 100, and, being a son of A. P. Indy, Honor Code should not be hindered by the added distance of the Remsen. Even at a short price, we can't oppose Honor Code. We also can't find much value from an exotic wagering standpoint. Cairo Prince was phenomenal in the Nashua, and Noble Moon also ran quite well in defeat. We simply do not see any clever ideas and do not feel that this is the right type of race to go fishing around for long prices. Betting Strategy: Honor Code on top. Cairo Prince and Noble Moon underneath in exotics. Eight horses are scheduled to go to post in this year’s edition of the Fall Highweight. The weight imposts range from high-weighted Strapping Groom at 135 pounds, down to Jake N Elwood and B Shanny, who each shoulder 127 pounds. Sage Valley is the selection here, and we think there is a good chance you’ll get all of his 3/1 morning line price and possibly a bit more than that. In his most recent start, in the De Francis Dash at Laurel, he broke slow, raced behind a moderate early pace, and suffered a wide trip while finishing dead last. For Sage Valley, it was the second straight dismal performance over a sloppy track. The betting public can get very attached to recent form, and Sage Valley had some unappealing recent form before receiving a freshening. However, he owns the field’s highest speed figure in 2013, earned when he won the James Marvin at Saratoga in a race where today’s 5/2 morning line favorite, Strapping Groom, was defeated by 8.5 lengths. Perhaps most crucial to his case is the fact that Sage Valley is trained by Rudy Rodriguez. Rudy’s training base is located at Aqueduct, and his horses train over this main track, which allows them a home field advantage of sorts. Throughout his training career, Rudy’s stats on the main track at Aqueduct dwarf his stats at most other tracks. Indeed, Rudy Rodriguez-trained horses are 177-47-34-29 (27% wins, 62% in the money and a dazzling $2.46 ROI) in sprint races over the main track at Aqueduct. Sage Valley has raced only one time over the Aqueduct main for Rudy, and he ran a still-standing lifetime-top speed figure of 116 in that try. That 116 also came as a three-year-old, and represented a new top by 18 points. Rudy Rodriguez has a very good trainer rating of 89 with horses off of similar layoffs. Sage Valley has been training well for this race, and he gets a favorable six-pound weight break from Strapping Groom today, as well as the services of Joel Rosario.